Abacus Bar & Kitchen is a cafe concept that could and should be replicated and enjoyed all around the world. It has embraced the 'all day dining' model with a breakfast menu that transforms into snacks and evening dining making it an option for any mood or customer. It also has a fully licensed drinks list and al fresco seating to suit the late afternoon Aperol spritz while people watching as one of Melbourne's busiest strips passes you by. 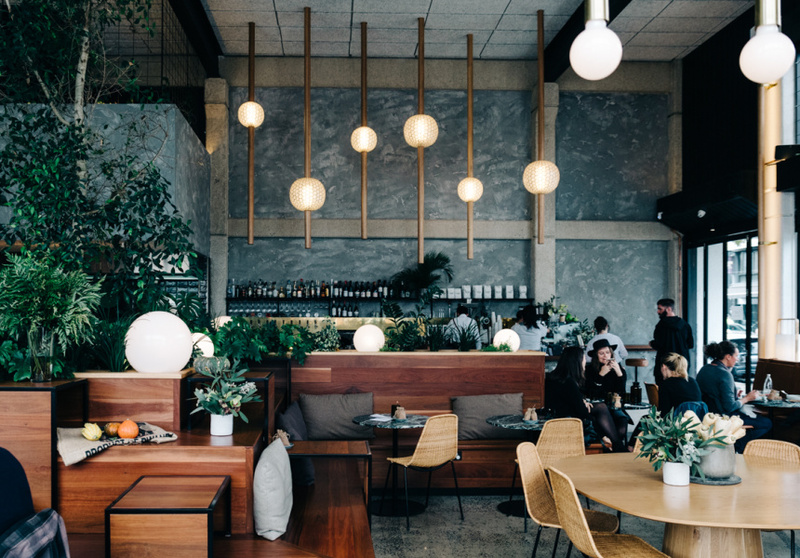 All of this inside one of Melbourne's best interior spaces that has popped up in the last year, Abacus provides a casual dining experience to remember. Our team love Abacus for 5 key reasons and these reasons resonate strongly with our predictions for food and hospitality in 2018. The food is good and honest, it has broken out of the traditional mould for opening hours, the customer service is elevated, sustainability is deeply rooted in their ethos and it's a design-driven space that you want to be in. These business characteristics harmoniously work together and the success of them shows in the lines of people waiting for tables to enjoy a meal here. 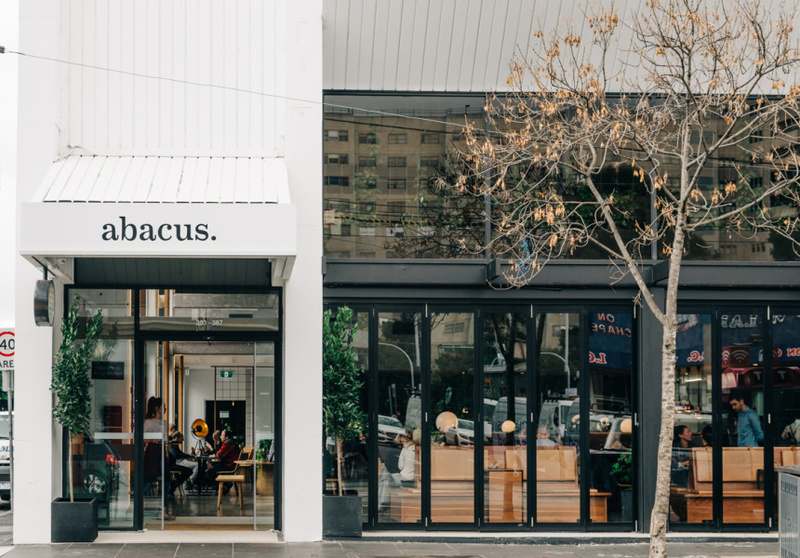 It's Saturday morning and you enter Abacus which sits in an old bank building next to Melbourne's fresh food market, Prahran Market. Your eyes linger upwards taking in every aspect of the double height space lined with greenery and dotted with beautiful glowing light fixtures. As you take in the space, you get a sense of what Abacus is all about - honesty and refinement. For every hard surface there is a natural softness to counteract it whether it's piles of fresh vegetables laying on a table or wooden planter boxes filled with herbs and plants. Once seated, your waiter is there for whatever assistance you might need and offering you drinks ranging from morning cocktails, fresh coffee or cold-pressed juices made in house. Looking at the menu, you can see the focus this cafe places on using good, local and wholesome ingredients with a statement on the page reading 'we mill our own flour, we bake our own bread, we cure and smoke our meats, we bake our own pastries, we keep our own bees'. You gather all these details of Abacus in 5 minutes of being there giving you, the customer, a full sense of what you're about to experience, the values that are being upheld (i.e. sustainable practices, locally sourced food, customer service) and what makes them whole. Achieving this is what makes this food and hospitality business such a success and an enjoyable place to visit time and time again. Everything you experience in the first 5 minutes is backed up by beautifully presented dishes exploring ingredients and flavour combinations that you could find in a high end restaurant. You can visit Abacus for breakfast, lunch, evening drinks, snacks or dinner. A menu favourite is the slow-fried cauliflower steak with smoked eggplant, pickled fennel, saffron, cucumber, fried egg but we suggest taking a group so you can try out the whole menu. Reservations can also be made online making it as easy as possible to get a seat at one of Melbourne's latest hotspots.